Last week I attended and spoke at a stem cell meeting at Rensselaer Polytechnic Institute (RPI). It was entitled, “Bioengineering and Stem Cell Research”. It was a great meeting with many interesting talks. Below I write about some of the talks and themes of the meeting. Still to come later this week I will do a second post entirely focused on the exciting RPE work of Sally Temple, who spoke at the meeting. One of the major themes of this meeting was, as Mark Noble put it during his talk, the urgent need for greater precision in defining our cells, whether they are stem cells or derivatives of stem cells. A lack of precise cellular identification interferes, Noble said, with comparing data within labs and between labs, patent evaluation, and therapy development. 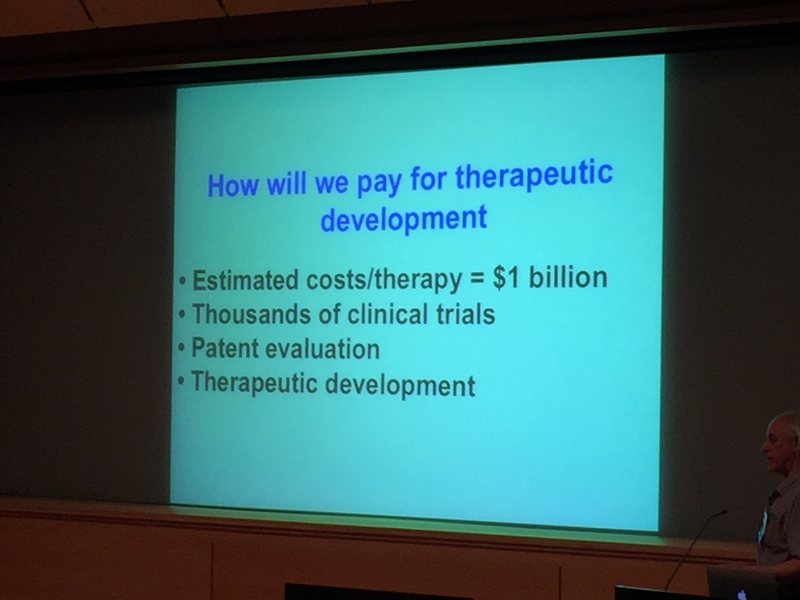 Noble also asked how we are going to pay for stem cell therapy development, which is a huge often overlooked issue (see slide above from his talk). One of Noble’s innovative ideas is to focus on already FDA approved drugs, providing an effective shortcut to the bedside. This is a potentially very powerful approach if you can find molecules amongst the already approved ones that do what you want. Mike West of BioTime also spoke at the meeting. He presented about their neat clonal derivative research from ESCs. The numerous determined stem and progenitor derived in this way have more focused differentiation potential that proves very useful and addresses the concern of heterogeneity of cell populations made directly from human ESCs. The talk of another speaker, Ron Hart from Rutgers, was somewhat of a cautionary tale. His team was working on IPSC made from patients with Ataxia Telangiectasia (A-T). The IPSC had with compound heterozygous mutations in the ATM gene. At some point in the process of studying these cells they found that a certain mutation was lost. It seemed to become WT and the team’s sense is that a spontaneous gene correction event occurred via the otherwise WT sequences of the mutant ATM alleles. It never occurred to me that a heterozygous line could essentially lose a mutation via gene correction. Another possibility that we should all be on the look out for is contamination of one IPSC line with another. Overall this was an exciting meeting and I don’t even include in that the tornado watch on the second day. Again, stay tuned for an upcoming blog post on Sally’s work on adult RPEs. The issue of precisely defining a cell as being this type or the other is one thing but I have a more fundamental type of confusion. Precisely what is the definition of the definition of a type of cell? Cells might differ in a lot of different ways. Different DNA sequences, different morphology, different methylation, different histones, different cytoplasm, different… Oh I give up, I just don’t know enough. Heck, from your previous posts I get the feeling that we don’t even have a “standard” human DNA — let alone knowledge about variation about that standard. After looking at Wikipedia, I am left with the uncomfortable feeling that the A-T mutation of the ATM-gene isn’t unambiguously defined? Perhaps a standard cell-type cannot be defined in the same way that we might define a standard for a type of molecule or for a car part? Such things leave me flabbergasted.